Let me begin by saying what an amazing first half of 2017 it’s been for The Floyd Mayweather Jr. Foundation! I would like to acknowledge the committee and staff members who are driven and passionate when it comes to executing the vision and mission of this organization. We look to continue to build a legacy for Floyd Mayweather’s charitable organization that parallels his greatness in the sport of boxing. Thus far in 2017 we’ve been able to extend our efforts to new partnerships that we believe align with our mission and touch more people along the way. TFMJF’s core is comprised of outreach in the areas of education, servicing the community, and health & wellness. We will look to introduce new initiatives that will allow for continued growth of our existing programs. 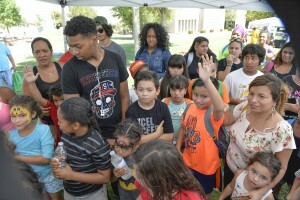 As you read this newsletter, you will learn more about our programs, latest initiatives, and the positive impact the collective efforts have on the Las Vegas community and surrounding areas. Our committed supporters and their dedication to serving the community has enabled our organization to propel in many ways. It takes numerous hours of planning and preparation, along with a strong force to execute our mission with excellence, and we can’t do it alone. The dedication and commitment of our volunteers and supporters has not gone unnoticed and we are thankful for anyone who has extended a helping hand over the course of our journey! As we progress and expand our partnerships, the friendships that we establish along the way will be critical in taking things to new heights! We look forward educating, leading, and inspiring in pursuit of reaching our goal, and are excited about the future of FMJF and the lives that will be touched! It’s that time of year again, and we are privileged to inform and update our readers on all of the amazing things the Floyd Mayweather Jr. Foundation has been working hard on to provide to our communities near and far! We have had a prosperous 2017 thus far, and now we look ahead to the second half of the year as we continue the momentum in achieving the goals we set for our education programs, health and wellness programs, and community outreach. We welcome readers to use our newsletter as a resource to learn about healthier living, staying active, educational opportunities, and ways to get involved with our events by either supporting, attending, or volunteering! Share this with friends and family so we can work together as a team in making the greater Las Vegas area a better place for our children and families. We believe that keeping everyone in the know is a crucial part of the overall well-being of the communities we serve, while adhering to TFMJF’s formula of continued success. Enjoy! With the first half of the year under our belt, The Floyd Mayweather Jr. Foundation continues its efforts to make a difference in 2017 through community outreach. Each year we look to create more initiatives that align with our goal to serve the Las Vegas community, create a positive impact and provide resources that help unify our fellow neighbors. Read below to learn how we dedicate our time to support local families in our communities and the success of our initiatives thus far. 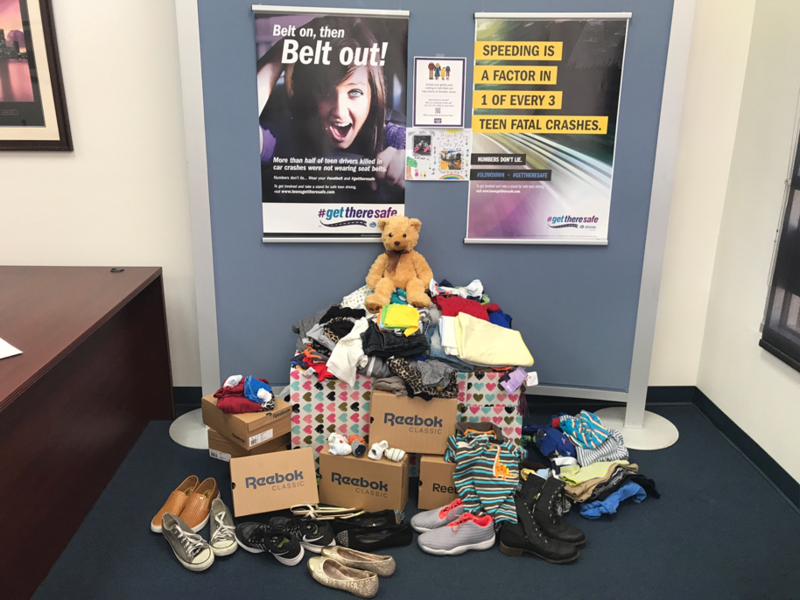 Our staff teamed up with Allstate Insurance to collect items such as diapers, baby and toddler clothing, women’s apparel, shoes and much more that were donated to Safe Nest, a local shelter in Las Vegas. Safe Nest is Nevada’s largest charity devoted solely to domestic violence issues. Women and children often arrive at the shelter with nothing more than the clothing on their backs. Together we were able to collect a large portion of essential items to help clothe women and their children at the shelter, giving them a sense of confidence and warmth. We are already working hard and planning our upcoming community outreach events, which include our Annual Thanksgiving Turkey Drive , and our Bowl-A-Thon which benefits the Big Brothers Big Sisters of Southern Nevada program. Stay tuned for updates. Summer is just about over, and while your kids may have enjoyed being out playing in the sun or at summer camps, now is the time for parents and students to shift focus on the 2017-2018 school year. 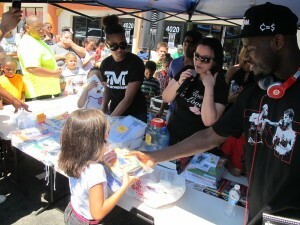 We brought back The Floyd Mayweather Jr. Foundation’s Annual Back-2-School Giveaway back for the 5th consecutive year! Families were provided the opportunity to receive necessary school supplies to help the youth excel in their studies. 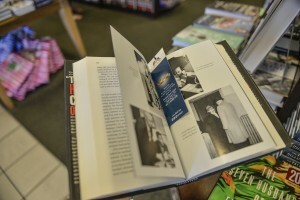 Our mission for this program is to promote literacy and academic enrichment. Our vision is to give children the opportunity to have reliable resources and tools needed to achieve success. This year’s event topped all previous events, as it was our biggest turnout to date. With the help of our supporters we were able to provide backpacks full of supplies to over 700 students, and 6 lucky students with laptop computers and printers. With Nevada’s primary schools ranked 50th in the nation in terms of “Chance for Success,” according to Education Week, The Floyd Mayweather Jr. Foundation will continue to advance and promote its core principle of putting education first. 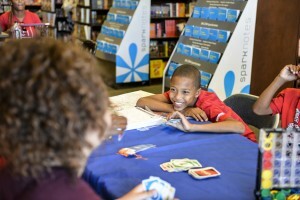 The Floyd Mayweather Jr. Foundation teamed up with Barnes & Noble in Summerlin, Las Vegas for the 2nd time to put together our Back-2-School Book fair Fundraiser event! 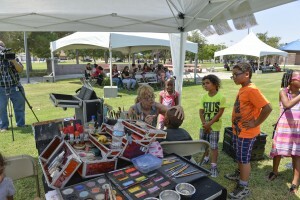 We were joined by families within the community for an afternoon full of games and interactive activities for the kids. This event was introduced to help support our goals in raising money for our Back-2-School Giveaway, enabling us to grow our event and provide resources to even more students! 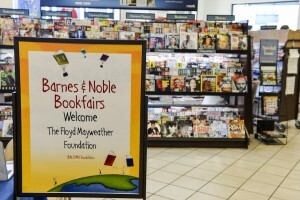 Barnes & Noble contributed a percent of proceeds from our book fair event and online sales, to The Floyd Mayweather Jr. Foundation. Are you, or someone you know, enrolled as a full-time student and trying to break into the sports and entertainment industry? If you are currently enrolled in an undergraduate or graduate school program with a major in communications or marketing, you may qualify to be a recipient of The Advancement of Women in Sports & Entertainment Scholarship. The Floyd Mayweather Jr. Foundation honors two women to receive The Advancement of Women in Sports & Entertainment Scholarship for the fall and spring school semesters. The scholarship was created to help fill a void, due to underrepresentation of women in the industry. This scholarship fund has been established to aid women in furthering their education, encourage their valued participation in the profession, and benefit the profession. According to The Women’s Sports Foundation, there are more than 6 million jobs in sport-related careers, a field which was once an exclusive male preserve. We believe that all women should have an opportunity to achieve their goals and excel in this once male-dominated field. Two applicants will be granted $1,000 toward the cost of education for the spring 2018 semester. Before applying for the scholarship ensure that the following requirements have been met. Citizenship or Permanent Legal Resident of the United States. Must be a female that currently resides in the United States. Must be able to demonstrate financial need and provide proper documentation upon request. If you meet the above requirements and are interested in applying, go to www.tfmjf.org/scholarships to download the application and read additional details. If you have questions, feel free to contact us at FFYE@tfmjf.org. The deadline to submit for the Spring 2018 scholarship is November 15, 2017. Help us in congratulating our recent Fall 2017 Advancement of Women in Sports & Entertainment Scholarship honorees, Sophia Koolwick and Kennedy Thorne, who are rising Juniors this upcoming school year! Read more about the career paths they have chosen and their goals below. Sophia Koolwick is a rising junior who has taken her mid-western flair south to SMU. She aspires daily to be an amazing person and works to improve any flaws by practicing admirable qualities until they become habits. What made Sophia so mindful of the personality she exudes and how she treats others you ask? Horseback riding! Sophia developed this distinguishable characteristic through her involvement as an equestrian. When she started taking horseback riding lessons at age five, she was too young to realize and appreciate that it put her on a path to becoming a strong and independent woman. But as time went on and Sophia aged, she realized that competing taught her to accept defeat with grace, how to overcome mentally, and keep pursuing goals until she succeeded. The valuable lessons she learned as a child have changed her life. Today, Sophia is a Division 1 student-athlete at SMU, who aspires to further develop her skills as a rider and as an effective communicator. As a double major in business and broadcast journalism, her goal is to become an on-air talent. Sophia has already been working towards that goal through various modeling and acting jobs that have landed her in commercials and videos. Sophia is excited about furthering her career in the entertainment industry and hopes that the experiences she’s had will make her an effective leader and mentor to those around her. 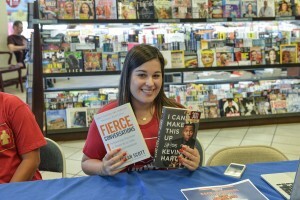 She’s also actively involved in her community and plans to remain a positive contributor to society. Passion Statement: Share sacrificially, love unconditionally, support enthusiastically, and trust completely! Determined to make her mark in radio and television, Kennedy chose to attend college at North Carolina A&T, a school that’s shown through the successes of previous alumni that her goals are attainable. Studying as journalism major with a concentration in multimedia and minor in political science, Kennedy has her sights set on becoming a talk show host that offers a unique platform of entertainment, politics, and a multitude of other interests while also being a voice for those who are often unheard. But until her goal can be reached, Kennedy hopes to score an internship in the industry at a radio, TV, or news station as a stepping stone. 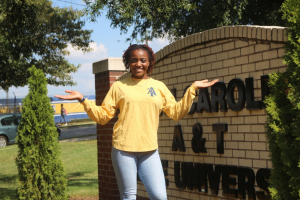 Kennedy is also a track and field athlete; another reason she chose to attend North Carolina A&T. She runs cross country and is a 400-meter hurdler for the Aggies, which sparked her SAAC membership. SAAC is a student athlete organization that allows its members to mingle with one another, brainstorm ideas for upcoming activities on-campus, and volunteer for the university and its surrounding community as a tour guide, setting up blood drives, and other community service projects. Kennedy is also very active participant in the University’s gospel choir that travels around the country. Adding to her accolades, Kennedy Thorne is also a proud honors student and she’s looking forward to being the director or producer of a new You Tube channel at North Carolina A&T that is set to debut this fall titled “Word on the Block”. Jayla Jenkins is a rising senior at Cleveland High School in Cleveland, Tennessee. With graduation and endless possibilities around the corner, Jayla keeps her eyes on the prize and stays focused throughout on what matters most, her education. 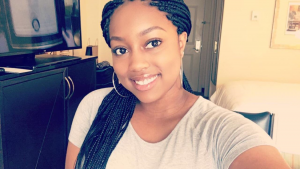 Read below to see how Jayla manages her 3.8GPA, what subject intrigues her the most, and what her interests are when school is not in session. Q: Is this your first time making Honor Roll, if not, how many times have you made Honor Roll? A: No, I’ve made honor roll several times in elementary school, all throughout middle school, as well as high school. A: English is my favorite subject. I enjoy reading and writing essays using writing prompts. Q: What is your favorite book/series? A: My favorite book is “The Catcher in the Rye” which was written by J. D. Salinger. Q: What helps you stay focused & motivated in school? A: I keep myself focused and motivated by striving to be a better person today than I was yesterday. Q: Who do you look up to as a role model, and why? A: I’ve always looked up to my aunt as a role model because she’s goal-oriented, determined to work hard for what she wants in life, while also continuously looking for ways to better herself. Q: Are you involved in any after-school programs or sports, if so, what? A: Over the years I have been involved in Anchor Club, Cosmetology Club, as well as International Club. Q: How do you juggle school and your after-school commitments? A: I’ve learned how to practice good time management habits, which allows me to prioritize the things I need to do for school and still have time for my after-school activities. Q: Do you have any other achievements or accomplishments that you would like to share with everyone? A: Throughout my high school years I’ve been awarded the Dreamkeepers Award, which is recognizes African American students that are exceling in education studies and maintain a 3.5GPA or better. I have also been honored in Cosmetology for top performance. Q: What do you like to do when you’re not in school or studying? A: In my free time, I enjoy reading and hanging out with my friends. Q: Tell us something about you that we haven’t already asked you would like us to share with everyone A: I enjoy traveling and have traveled to over ten states. I love meeting new people and being introduced to new cultures; it can be a fascinating learning process. Tajimier Jones of Paterson, New Jersey excels in both academics and sports and makes it look easy! Tajimier may have a love for football and track and field, but that hasn’t stopped him from maintaining a 3.2GPA at Pope John XXIII High School his sophomore year. Read the Q&A that we conductedwith Tajimier to learn what motivates him, who he looks up to, and how he juggles his rigorous schedule. A: No, I have made Honor Roll often. A: Math is my favorite subject. I’m very good with numbers. Problem solving has always been one of my strengths. A: I love the memoir “Basketball Junkie” by Chris Herren and Bill Reynolds. A: I want to be successful and support my family, so that keeps me motivated. A: Victor Cruz. He’s from the same city as I am and he’s had a successful career. He’s shown that hard work pays off. 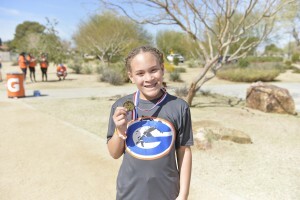 A: Yes, I am a committed football, and track and field athlete. A: I stay on a strict schedule which allows me to keep my academics and sporting commitments in line. 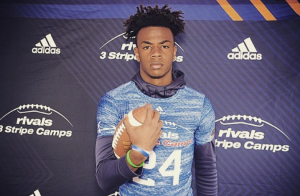 A: I am considered the #1 Wide Receiver in New Jerseys class of 2019 per The McCarthy Report by the late Dennis McCarthy. A: I enjoy health and fitness so I like to work out and keep stay in shape in my spare time. A: When I’m older, I want to visit every major city and travel the world. Harlem Taylor born and raised in Los Angeles, California, is a multi-talented kid who has dreams of making into the NBA one day. Although Harlem has had opportunities, growing up with a famous dad, he is still a very humble and focused kid who works hard in school and understands that in order to be taken serious and get into a good school he must maintain good grades along with his all-star performance on the court. 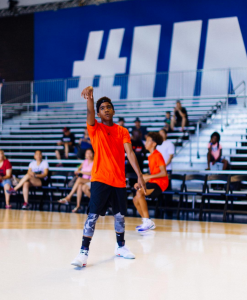 We got a chance to catch up with Harlem to find out more about how he juggles sports and school, what keeps him motivated, and who he looks up to in our Honor Roll Spotlight feature. A: No, I have made Honor Roll every year since I was in the 4th grade. A: I’m pretty good at Math so I’d say Math, but I like science too. A: I have little sisters and I know they look up to me so my parents tell me how important it is for me to be a good role model to them. I want to get into UCLA or USC for basketball so that also helps me when I don’t really want to my homework or study. A: My parents. Both of them have done a really good job to give me the best and they support me with my sports and school, no matter what it is I need they make a way for it to happen. My dad has been successful and he came from nothing, so I think that’s really helped me to stay humble. A: Basketball and track, but I think I will just stick to basketball next year. A: I have a schedule and I set time to do homework and practice my skills for basketball. A: I’ve won numerous championship titles in basketball and last year I won my schools spelling bee. A: Hang out with my dad and friends. My dad and I play ball a lot together, it helps keep me on track. A: I was able to go with my dad on tour last year to Europe, which was pretty cool. I think if the NBA doesn’t work out I would like to play overseas there. A: It is my first time actually having grades because my previous schools did not have a grading system. That was one of the reasons why I switched to my current school because of the grading. My previous school did not push me to my limit, which made me smarter than most kids because for the work we would do we would only get a good job sticker. A: Math because it is one the easiest subjects for me and I am really good at it. I don’t prefer a certain math topic, but word problems are sometimes challenging. A: To stay focused I just zone out everything around me. To stay motivated my parents always give me encouraging words and push me to do better. This year I got a new IPhone at the end of the school phone as a reward for getting perfect grades. A: My dad because he is a very positive and helpful person. He doesn’t just help make me a better person, but he’s there to help others as well. A: I’ve participated in a variety of activities. I am currently playing soccer and dance (hip- hop, krunk, jazz). A: I go to Safekey every day and I finish all of my homework there. Then I get picked up and go to my after-school programs. Wednesday’s and Thursday’s I do soccer, and the rest of the week I have dance. Saturday’s I have soccer games and Friday’s and Sunday’s are my only days off. 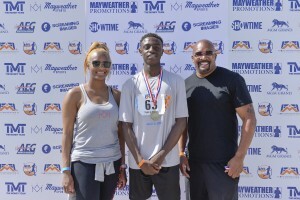 A: I participated to the USATF Junior Olympics 2 years ago and competed 4x100M relay. It was a great experience and it took a lot of hard work and commitment to advance. A: I like drawing, especially anime characters. Q: Tell us something about you that we haven’t already asked you would like us to share with everyone (ideas: could be a cool place traveled, an interest such as animals, etc). A: I have a teacup Yorkie named Z. I’ve traveled to a lot of places, but I’ve been to Hawaii the most times and I love it! I also like Laguna Beach because of the cool fresh air, and it isn’t super hot like Vegas weather. 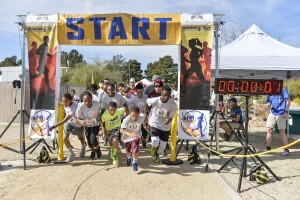 Without a hitch, The Floyd Mayweather Jr. Foundation hosted its 3rd annual Fight-4-Fitness 5K RUN, 2K WALK, KIDS FUN RUN, & Community Day on March 12, 2017. 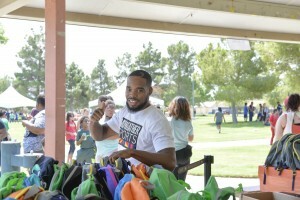 What an incredible and unique event this turned out to be as many families from the Las Vegas community came out to Sunset Park to join us: parents, children, trainers, boxers, and track teams gathered in support of establishing a better quality of life. Our goal for Fight-4-Fitness, is to spread the importance of health and fitness awareness throughout the community in a fun interactive way. 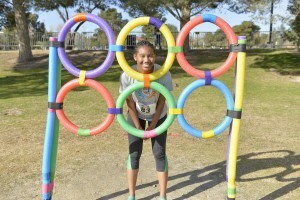 The festivities kicked off with our traditional fun-filled scavenger hunt for children ages 12 and under, which was followed by the 5K Run, 2K Walk, and Kids Fun Run. 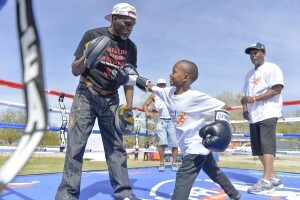 Mayweather Promotions’ fighters and trainers had the opportunity to work with children giving them one-on-one boxing lessons in the full-sized boxing ring. 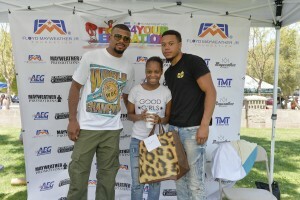 WBA Light Heavyweight champion, Badou Jack and NABF Cruiserweight champion, Andrew Tabiti participated in the sack races and tug-of-war with the kids, challenging their physical activity levels. 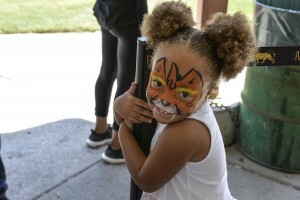 The event truly provided an afternoon of fun and smiles to everyone in attendance. We are thankful to our supporters for making this year’s Fight-4-Fitness a success! Physical exercise and a nutritious diet can lead to improved health, positive thoughts, and resilience to keep moving forward. Mental and physical wellness is key in surviving the fast-paced world we live in today. At TFMJF we recognize the affects that food has on us and there are many studies that have proven that we are what we eat. Implementing a colorful diet with many vegetables and fruits is a simple step toward healthy practices and overall wellbeing. We’ve gathered a few healthy lifestyle tips below that will keep you active, physically fit, and health conscious daily. Fitness is right at our fingertips and we have technology to thank for it! Men and women alike have long used decade-old excuses for not exercising but as time goes on excuses are just that! For the tired, overworked, busy people of the world, fitness trackers have stepped in to keep track of our habits. Check out one of these 5 must-have fitness trackers to determine which works best to help you set new health and fitness goals, track your steps, heart rate, and more! No Time, Equipment, or Gym Membership? No Problem! Our everyday lives are so fast-paced that we barely remember to breathe! Thus, the time, energy, and effort that we all think is needed to stay fit pushes working out to the bottom of the “to-do” list. After today, there is no longer an excuse! HIIT (high intensity interval training) is a workout that alternates between activity of varying intensity levels with incorporated periods of rest. HIIT workouts require very little time, are equipment-free, cost nothing, and can be performed anywhere! HIIT is also heart healthy and burns more fat in a small amount of time. Fitness exercises such as push-ups, squats, and burpees are combined into a brief routine and completed for a set amount of time with 100% intensity. The HIIT workout can also be incorporated into your strength and conditioning, calisthenic, and weight training routines for additional cardio and fat burning. Free apps like “Seconds” and “Interval Timer” have made it easy to store HIIT workouts in your phone and time your intervals hands-free. “Wahoo 7” features a few 7-minute complete HIIT workouts with 12 exercises and gives you access to many more for a nominal fee. On days where you may have more free time available, a HIIT workout DVD can be utilized at home or you can search for the nearest gym with a group HIIT workout class like www.goldsgym.com. We’ve provided a challenging HIIT workout that can be completed in just 10 minutes! Why wait? Get fit today! Inflammation is part of your body’s natural way of healing. Our immune system induces inflammation to protect the remaining cells in the body while isolating any injuries but too much of a good thing can quickly become a bad one. Did you know that oftentimes our body may not get a signal to stop the inflammation and can lead to a host of diseases like cancer, diabetes, obesity, arthritis, depression, Alzheimer’s, and heart disease? If you didn’t know that, then you probably aren’t aware that one of the easiest ways to combat inflammation is to make better food choices! If you’re suffering from joint stiffness, joint pain, swelling, and fatigue associated with inflammation your first line of defense is your diet. Skipping sugary beverages, added sugar, red meat, refined grains and foods high in saturated fats is essential in eliminating inflammation. Not only do you have to avoid foods that trigger inflammation, anti-inflammation foods need to be added to your diet. The best inflammation fighting foods are easy to grab snacks like nuts and berries, simple meals such as whole grains, dark leafy vegetables, and fatty fish (salmon, mackerel, tuna, sardines), or the staples in our fridge and pantry that make those simple meals taste better! Adding foods with anti-inflammatory benefits will not only reduce inflammation in your body but will eliminate any pain and swelling while creating a healthier lifestyle. Use this food pyramid to gain insight on the best anti-inflammation food options. The American Diabetes Association has now recognized further effects of the disease, to include emotional issues related to the burdens and worries of living with diabetes, depression, anxiety and eating disorder. A new lifestyle can be achieved by taking a few simple steps, be full aware of what you’re eating, eat well balanced meals. Physical activity is just as important as your diet; regular physical activity helps your body use insulin more efficiently, so keep moving! 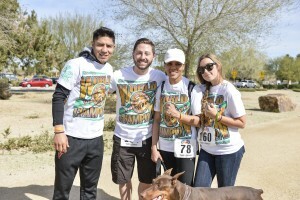 The Floyd Mayweather Jr. Foundation would like to extend our gratitude to everyone who has continuously supported our efforts throughout the years, whether it was your first time volunteering or if you’re a seasoned supporter. We strive to make a positive impact within the community and we rely on all of our for continuous support and dedication in making each event a success. One of the greatest and most rewarding ways to give back is through taking time out to provide service to help others. There are many benefits to becoming a volunteer such as: developing new skills, fulfilling a void in your community, meeting new people, and expanding your horizons. We are pleased to acknowledge the 150 volunteers, and over 500 hours we have collectively dedicated to serving the community since the start of this year. Over the years, we have united our community with the help of various volunteers who have invested their time and energy to improve our youth education and fitness programs through events such as: Our Back-2-School Giveaway, Fight-4-Fitness, Bowl-A-Thon, and our Thanksgiving Turkey Giveaways. Each of these events has supported our efforts to build a strong community alliance, solve hunger among the less fortunate and provide resources for a healthier lifestyle. We look forward to growing our community of volunteers and bringing bigger events in the future, and we welcome future volunteers to help us reach our goals! There are several ways you can contribute to making our efforts more impactful. 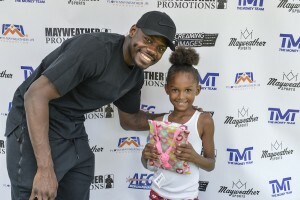 We welcome any contribution to The Floyd Mayweather Jr. Foundation, simply visit: http://tfmjf.org/connect/make-a-difference/. If you are interested in sponsoring or volunteering for one of our programs, please feel free to contact us via email at, contact@tfmjf.org. Each and every person counts! 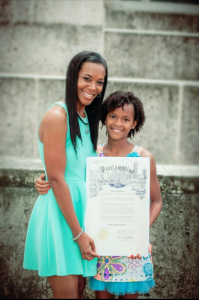 Philanthropy Spotlight: Princess Jackson of Sock Out Poverty, Inc! 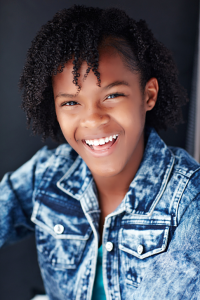 While most 9-year-old children were playing with dolls, joining sports teams, and enjoying the outdoors, Princess Jackson was focused on the bigger picture: her impact on the world. Not many children think about the well-being of others at such a young age, especially that of strangers. But Princess Jackson thought differently! While giving away blankets with her mother to those in need, Princess noticed that many had socks with holes in them or no socks at all. 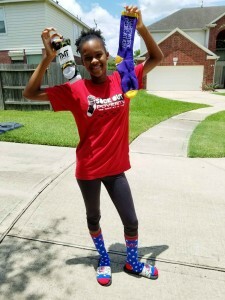 After seeing the homeless walk the streets with bare feet, Princess knew her mission was to “Sock Out Poverty One Step at a TimePrincess used her love for socks, particularly those with unique patterns and cool colors to create “Sock Out Poverty Inc.”; her love for something that seems so minuscule inspired a movement. “Sock Out Poverty Inc.” is a non-profit organization that provides socks to all in need through raising donations worldwide for men, women, and children of impoverished communities. Four years later, Princess Jackson’s budding idea has developed into so much more! Princess was recognized and honored by the mayor of her hometown in Houston, Texas with an official proclamation for her work in the community by making July 7th Princess Jackson Day. Of course, all this work could not happen without the guidance of executive director and ‘momager’ Phyllis Burton, who works to ensure the goals of Sock Out Poverty Inc. are met, while also partnering with other community focused organizations such as Kids Meals on Wheels, MD Anderson Cancer Center, 40z Rock Organization, The Ballard House, and City Wide Club Events Organization. We had the opportunity to catch up with Princess Jackson and Phyllis Burton so they could tell us more about the organization, their recent endeavors, and how the community can help! When was the organization started and how old were you? Sock Out Poverty was started 4 1/2 years ago (2013). I was nine years old. How often are you giving socks and other donated items away? I have two sock drives per year. “Christmas in July,” held the second Saturday in July and every Christmas Eve. Do you work with a certain company to purchase socks in large volumes? No, I don’t have a certain company I purchase socks from. Sock donations come from volunteers, sponsors, and business owners. What made you want to give back to your community at such a young age? I always saw my mom giving back to the community and witnessed what a blessing it was to help others. It gives me joy within my heart to be able to help those who are in need. Are you working on any new partnerships and projects? Yes, we are working on going global and partnering with The Salvation Army in Atlanta, Georgia. Our future project is to be able to “Sock Out Poverty” in different states. Through the services and donations of Sock Out Poverty, poverty will be reduced and lives restored. Are you in need of specific items besides socks? Yes, we always take different items such as blankets, jackets, hats, and any clothing items that would benefit the less fortunate. What other items do you collect besides socks and clothing? At this time we only have received sock and clothing donations. If other items are donated in the future, we will gladly receive them to benefit the homeless community. How many socks do you think you have donated to the homeless or homeless shelters? Sock Out Poverty have donated over 10,000 pairs of new socks to help those in need! We’ve been to Dallas, San Antonio, Beaumont, and my hometown Houston, TX to donate socks to those who are in need. San Antonio Altitude trampoline park is a great partnership due to the amount of barely used socks they can donate from their clientele. Are you working toward or interested in getting more trampoline parks or bounce houses involved? Yes, we are reaching out to trampoline parks in different cities including Dallas, Beaumont, and Austin. What methods are you using to reach out to the community for donations? If using social media, please share your handles with us! Others may get involved by sending new socks donations to P.O. Box 84904, Pearland, TX 77584. You may also donate online at sockoutpoverty.org. Is there anything you would like to say to other children that may want to get involved in their community and don’t know where to start? If getting involved in the community and helping others is your passion don’t give up. Get involved. Find out the need within the community and do what you can to help with that need. I was on a blanket drive with my mom and saw the homeless didn’t have socks to keep them warm. Because of my fondness for socks and I wanted to give back to the community, and Sock Out Poverty was created. No idea is too small. You can make a difference! What is the most memorable moment that you’ve had since creating Sock Out Poverty? The most memorable moment I’ve had with Sock Out Poverty, is when the homeless encourages me to keep doing what I’m doing. I love interacting with them. During Christmastime, I get to play games and sing songs with them and this brings me joy. This is what I look forward to every Christmas Eve! Have you inspired other children to get involved in Sock Out Poverty? Yes, I have inspired all ages to volunteer for my organization. We have had as young as 3 years old to the elderly come out and help us sock out poverty. The homeless is impacted and so are the volunteers. 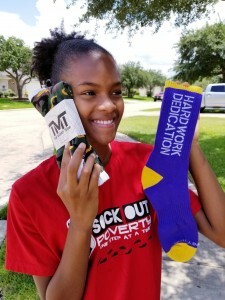 The Floyd Mayweather Jr. Foundation commends Princess on her ability to make her a dream to help those in need a reality, with Sock Out Poverty Inc. We believe it’s important to support other charitable organizations and recognize the efforts of those who strive to make their community better. 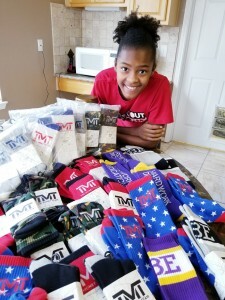 The Floyd Mayweather Jr. Foundation in conjunction with Mayweather Promotions is honored to donate 50 pairs of socks to Sock Out Poverty Inc.
To learn a little more about Princess Jackson and the positive impact she has made on the community through Sock Out Poverty Inc., follow her social media platforms or go to the website at: www.sockoutpoverty.org. If you are moved to contribute to their cause, donations are accepted in person, via mail, and online. Check the donation page on the website for more details!